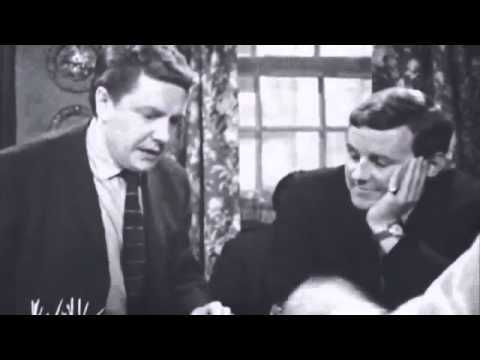 Richard Briers - Do You Remember? If there was ever an English actor that you felt like you really knew, despite having only seen him on stage or screen, it was Richard Briers. He could play classical roles, he could play serious roles, he could play intense roles and he could play the villain but his – and I apologise to everybody for using this word – ‘likeability’ (see? I really am sorry) shone through to such an extent that I’m sure most people would be forgiven for thinking that he and his most-loved character, Tom Good, were probably pretty similar. It was this ‘amiable everyman’ quality that made him seem so familiar; those twinkling eyes and that friendly smile had you drawn in from the moment he stepped into view. He was the mate that you’d while away an afternoon over a pint with, the cute bloke in the office who’d grin at you over the photocopier and, later on, the charismatic grandad who’d never tire of telling you stories and making you laugh. There’s a chance, of course, that you’ll think I’m over-romanticising Richard Briers’ appeal because he’s no longer with us but I’m not so sure I am. He was one of those actors who stole attention with his presence and his ability was such that even though he will forever be remember as the self-sufficient Tom Good in 'The Good Life' and you are unlikely to forget his obsessive Martin Bryce or eccentric Hamish MacDonald either. And that’s just three of his television roles that you’ll remembered; his stage roles numbered many and a generation of children will remember his voice as Fiver from Watership Down and that of Roobarb’s narrator as well. Richard David Briers was born on January 14th 1934, in Raynes Park, London. Perhaps he was destined to be part of the showbiz world: his mother Morna was a concert pianist and an Equity member and his older cousin was gap-toothed, impressive moustache-wearer Terry-Thomas. Briers attended schools in Kingston-upon-Thames and Wimbledon (leaving with no formal qualifications) before taking a clerical job with a cable manufacturer in London. He also started evening classes to become an electrical engineer but thankfully, for the world of acting, that didn’t prove to be his calling. Richard graduated with the Academy’s Silver Medal, a love of comedic roles and a scholarship to the Liverpool Reparatory Company, where he stayed for 15 months. His first professional stage role was at the Playhouse in the city, before he toured the country in a farce and got involved with reps in both Leatherhead and Coventry. In 1959 Richard made his West End debut in Gilt and Gingerbread, a play by Lionel Hale, which was staged at the Duke of York’s Theatre. Frank Muir (Call My Bluff) and Denis Norden (It’ll Be Alright on the Night, Laughter File) were in the audience for one performance and they later offered Briers the lead role in their BBC television series Brothers in Law, based on Henry Cecil Leon’s book of the same name. He played new lawyer Roger Thursby in the 13-part series which ran from April until July 1962. That led to another television opportunity: starring opposite Prunella Scales (Fawlty Towers, After Henry) in five series of sitcom Marriage Lines (1963 – 1966), also on the BBC. Tom Good was a character written expressly for Briers. The BBC’s Head of Comedy, James Larbert approached writers John Esmonde and Bob Larbey in the early 1970s and asked them to write a sitcom with a part for Briers in it; from which came a story of a man determined not to let his life slide past him in a blur of dull office routine. 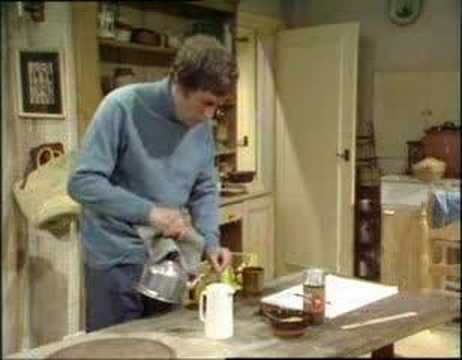 The Good Life, which first aired in 1975, was an immensely popular and aspirational sitcom; it struck a chord with anybody who had ever dreamt of handing their notice in and living a more satisfying, at-one-with-the-land lifestyle. Of course, it also struck a chord with an army of middle-aged men, who were more than happy to spend half an hour ogling Felicity Kendall in her denim dungarees. 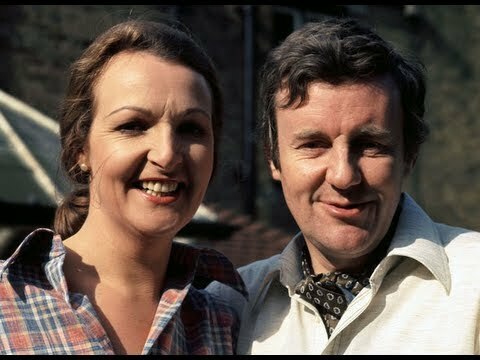 Warm performances by Briers and Kendall, great scripts with genuinely funny and touching moments throughout, as well as a stellar supporting cast in Paul Eddington and Penelope Keith as next door neighbours Jerry and Margo Leadbetter made it a BBC classic. That was not the only collaboration Briers had with Esmonde and Larbey: in January 1984 the first episode of Ever Decreasing Circles went out on BBC1. It was the same sort of gentle suburban comedy as The Good Life but with distinctly darker undertones. Briers played Martin Bryce, a well-meaning but obsessive and occasionally petty man who only felt calm when he was in control of every little detail of his, and often other people’s, lives. Four series went out and it was, again, a much-loved hit: pulling in approximately 12 million viewers it was voted number 52 in the BBC’s Britain’s Best Sitcom poll in 2003. The Good Life took number nine. At around the same time Briers was offered the role of Rev Philip Lambe in ITV’s All in Good Faith (shown from 1985-88), a kindly vicar who has transferred from a wealthy rural parish to a rougher, inner-city one. Not a particularly lauded series but his talent shone through nonetheless. If You See God, Tell Him was another BBC sitcom in a blacker vein that was broadcast in 1993; Briers played Godfrey Spry, a man who suffered terrible physical harm in a couple of accidents and is left with a broken short-term memory. The comedy arises from his pastime of watching television adverts, believing the claims made by them all and acting on them – leading to all sorts of mishaps. There were only four episodes ever made and the climax was Spry being arrested for murder and imprisoned in a hospital for the criminally insane. Yes, it really was a comedy. His television career did not curtail his stage one, however. He was equally respected for his abilities in both media and kept them both running at the same time. He was comfortable in a variety of roles and, over the years, performed in plays by Shakespeare, Ackbourne, Ibsen and Bernard Shaw, amongst others. A visit to Stratford-upon-Avon to watch Kenneth Branagh in Henry V led to his meeting the actor and director afterwards and Branagh offered Briers the chance to play Twelfth Night’s Malvolio in his Renaissance Theatre Company’s interpretation. Many other roles with the company followed, as well as parts in Branagh’s many film adaptations of Shakespeare, including Much Ado About Nothing in 1993 and Hamlet in 1996. Later television roles would also see Briers in Morse, Lovejoy, Midsomer Murders, Monarch of the Glen, Kingdom, Doctors, Extras and more. As famous as Brier’s face was throughout his career, his voice was also equally recognisable. This was due, in part, to the number of commercials that Briers leant his vocal talents to but in the main was down to his aforementioned fabulous narration of wobbly, psychedelic animation Roobarb, which was first broadcast in 1974. Roobarb was written by Grange Calvely and produced by Bob Godfrey, who were also the team behind cartoon Noah and Nelly in…SkylArk (1976 - 1977), again narrated by Briers. In 1978 Richard lent his voice, memorably, to the character of Fiver, in rabbit sob-fest Watership Down. His relationship with his wife was as enduring as his career. He met her, Ann Davis, also an actor, at Liverpool Rep and married her in 1956. They had two children, Lucy and Kate; Lucy is also an actress, who starred in the BBC’s 1995 adaptation of Pride and Prejudice. Richard Briers died on 17 February 2013, aged 79, of a lung condition which he attributed to smoking ‘five hundred thousand cigarettes’ over his lifetime. Although there are hyperbolic outpourings of grief when any famous person dies you could feel the sincerity of the tributes from those who knew and loved him. He was referred to, variously, as modest, self-deprecating, sweet, wonderful, charming, courteous, generous, a national treasure, an absolute gentleman, a terrific actor, adorable and funny. Not a bad way to be remembered really. Do You Remember Richard Briers?